The Storm featured three of the original members of Journey: Gregg Rolie, Ross Valory and Steve Smith. They were joined by Kevin Chalfant (who had been with Valory's previous band The View) and guitarist Josh Ramos. The debut eponymous album was well received but as Ross Valory says "There was a stigma attached to the band because people said 'these are members of Journey, but it's not Journey'. We didn't gain the recognition we deserved. Record executives would say that although it was good music, it wasn't really what they were selling at the time. They thought the demographic for The Storm were baby boomers." The album yielded two American hits 'I've Got A Lot To Learn About Love' and 'Show Me The Way' and was well-received critically. The album veered between these power ballads and heavier rock, such as 'In the Raw' and 'Touch And Go', whilst another ballad 'Can't Live Without Love' would appeal to any Journey fan. The band supported Bryan Adams on his tour in 1992 and recorded a second album with Ron Wikso replacing Smith on drums. 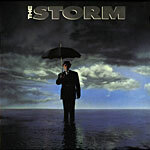 'Eye Of the Storm' was shelved by the band's label Interscope Records and later came out in 1996 on Music For Nations in Europe and Miramar in the USA.